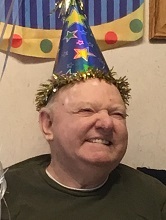 Thomas Joseph Reardon, Jr., 72, Nevada, MO passed away on Sunday, February 3, 2019 at Bristol Manor of Nevada. Tom was born August 21, 1946 in San Francisco, CA to Thomas Joseph Reardon, Sr. and Lillian Marie (Boal) Reardon. Tom was raised in San Francisco along with his younger brother, Larry, and several cousins. After graduating from Catholic School, Tom joined the US Air Force, where he served as a mechanic starting in Jan 1966. He referred to his time in the USAF as his “wing-nut” days, and fondly recalled his time in the service, especially his duty station in Madrid Spain. Tom loved his unit and was honorably discharged January 1970. Tom was baptized as a member of the Church of Jesus Christ of Latter-day Saints in 1967 in Glendale, CA and remained true to his faith until his passing. Tom met Joellen Celaya in California, and they were married from January of 1978 to June of 2010. Tom and Joellen had one child, daughter Victoria, in 1990. Being born and raised in San Francisco, Tom was a lifelong 49ers fan, even after moving to Missouri in the 1980s, where he did develop an affinity for the Kansas City Chiefs. His daughter fondly remembers watching a game between the two teams and watching Tom cheer for both, but just a little louder for the 49ers. The greater part of Tom’s life has been in service, whether as a Boy Scouts leader, driving school bus, working at Challenge-N-Change boys home or his many years of being an umpire specializing in baseball, softball, basketball, and volleyball. He had a natural rapport with these youth, and many looked up to him and will remember his wit and helpful guidance long after the campouts and games have blurred in memory. Tom will be most remembered for his affinity for the outdoors, especially hunting and fishing, and for his stubborn, yet compassionate nature. Tom took the USAF motto to heart – “Aim High…Fly. Fight. Win” and throughout his life, he did just that. Tom is preceded in death by both of his parents, his stepmother, Marianne Iola (Carlton) Reardon, his stepfather, Chester E. “Chet” Smith, and several cousins, including Barry Reardon of CA, who was also one of his best friends. Tom is survived by his daughter, Victoria Vindra (Reardon) Carpenter, and her husband Ethan Carpenter of Nevada MO, his ex-wife, Joellen C. Reardon of Dutch John, UT, his brother, Larry Reardon and wife Sue Reardon of NSW, Australia, several cousins in CA including Ed Reardon and wife Patty (Matysik) Reardon, Mike Reardon and wife Susan (Picchi) Reardon, Patti (Reardon) Ploshay and husband Joe Ploshay, and Frank Reardon and wife Dayna (Smith) Reardon, a plethora of nieces and nephews, including Jamie Reardon of New Zealand and Emma Joy Reardon of NSW, Australia; Jane (Celaya) Nye and husband Mike Nye, Kathy Celaya, Jon Celaya and wife Katie (Phillips) Celaya, Aaron Celaya and wife Kristi (Uribe) Celaya, Jacob Celaya and wife Luziane (Borges) Celaya, David Celaya, all of UT and Van Allen Celaya II and wife Kelly (Emerson) Celaya of Lee Summit, MO, and numerous great-nieces, nephews, cousins and friends. Funeral services will be held at 10:30 a.m. on Friday, February 8, 2019 at Ferry Funeral Home in Nevada with Bishop Tim Claypool officiating. Interment with Military Honors will follow at 12:30 p.m. in Ft. Scott National Cemetery in Ft. Scott, KS. The family will receive friends from 5-7:00 p.m. on Thursday evening at the funeral home. The Church of Jesus Christ of Latter-day Saints will hold a luncheon/dinner at the LDS Chapel (1101 N Olive, St.) in Nevada, MO at 2:00 p.m. for those who wish to attend. Memorials are suggested to Nevada R-5 Athletics or Nevada Little League Baseball in c/o Ferry Funeral Home.